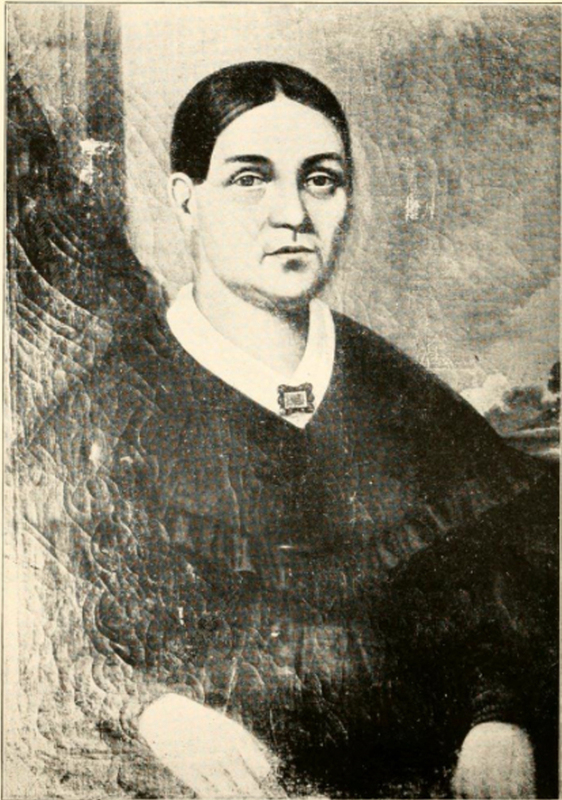 Josette Vieau Juneau (1804?-1855), was the Métis “founding mother” of Milwaukee, who midwifed the settlement, literally and figuratively, in its formative years—and was the grandmother of a Métis U.S. Senator from Wisconsin, Paul O. Husting. Menominee and French Canadian, she was born in Green Bay—when still called La Baye, a vestige of its Nouvelle France origins, before American control in 1815—but also grew up in Milwaukee, site of another of her father’s seasonal posts. By 1818, Jacques Vieau hired French Canadian voyageur and clerk Laurent Solomon Juneau. He married the boss’s daughter in 1820. Fluent in French and Native languages, as he was not, she served as his interpreter, ran the post in his trips to trade with tribes, raised thirteen children, and was midwife to American newcomers. They praised the “queenly presence” and “high courage” of the “brave-hearted” and “most amiable and excellent woman.” They credited her “calm and stoical self-possession” for saving the settlement when she mediated peace with aggrieved Potawatomi. Although this was possibly an apocryphal account, it signified Métis wives’ role as “cultural mediators,” in providing economic alliances and access to tribal trade networks. However, Catholic Métis also married Frenchmen for religious reasons, and her home hosted Milwaukee’s first mass. The Juneaus’ marriage was loving and lasted for decades, despite losses, including her home. More than his politics, with election as the first mayor in 1846, his religion and her Metis heritage were less welcome in the city by mid-century. In 1848, they moved to Theresa, Wisconsin. However, in 1852, for medical care, he brought her home to Milwaukee, where she died. He died a year later, almost to the day. ^ Dates are from the family grave marker in Calvary Cemetery, Milwaukee. However, sources state her birth year as, variously, from 1800 to 1804. ^ Milwaukee’s “origin story” of its first permanent resident, a century ago, was based upon criteria that could only result in a “founding father,” a male, not of Native heritage. It was formulated by a self-appointed committee of an all-male Old Settlers’ Club, according to a member and an editor of the Milwaukee Sentinel, also a son of the city’s first German settler. See H.W. Bleyer, “The Founder of Milwaukee,” Milwaukee Sentinel, November 11, 1906; Bayrd W. Still, Milwaukee: The History of a City (Madison: State Historical Society of Wisconsin, 1948), 10; and Genevieve G. McBride, “Helpmeets, Hausfraus, Hellions, and More: The Missing Majority in Milwaukee History,” in Perspectives on Milwaukee’s Past, eds. Margo Anderson and Victor L. Greene (Urbana: University of Illinois Press, 2009), 194-95. ^ Her descendants included U.S. Senator Paul O. Husting of Mayville. See Robert M. LaFollette, “Address of Mr. LaFollette, of Wisconsin,” in Paul O. Husting, (Late a Senator from Wisconsin), Memorial Addresses Delivered in the Senate and the House of Representatives of the United States, Sixty-fifth Congress. Proceedings in the Senate March 2, 1919. Proceedings in the House February 23, 1919 (Washington, DC: Joint Committee on Printing, Government Printing Office, 1919), 9-10. ^ Peter J. Vieau, “Narrative of Peter J. Vieau,” in Wisconsin Historical Society Collections 15, ed. Reuben Gold Thwaites (Madison: State Historical Society of Wisconsin, 1900), 459-66. The name and marital status of her mother, variously stated as Vieau’s first wife or as his companion in a “country marriage” (without presence of a priest), are not verified. Vieau Juneau was raised by his wife Angelique (variously, Angeline) Roy (variously, LeRoy), also a Menominee (variously, identified as a Potawatomi). ^ Marion Lawson, “Solomon Juneau: Milwaukee’s First Mayor,” Wisconsin Magazine of History 41, no. 2 (Winter 1957-58): 113-23. Some sources date the marriage as earlier and also vary on the date of their settlement in the city. Peter J. Vieau recalled that the Juneaus wed “as early as 1814 or 1815,” when the bride would have been barely ten years old. As Lawson states, his memory was “often hazy,” as was that of Andrew J. Vieau, who recalled that the footloose Frenchman “did not consider Milwaukee home” until the mid-1830s. However, Lawson writes, “Josette considered it home”—and, had she been born but a generation earlier, when French marital property laws remained in force in parts of the region, she may have inherited the post in Milwaukee. Not until 1831, when Menominee ceded their property in the future city, did her husband become a U.S. citizen, as required for the purpose of purchasing her foremothers’ homelands. By then, under American law, married women could not own property, and not for almost another century could many Native Americans—including some Métis—be citizens. ^ Lawson, “Solomon Juneau.” Sources date their Milwaukee settlement variously, perhaps owing to differing definitions of the seasonally nomadic nature of life for fur-trade families. Sources also vary on their family size, but she bore as many as seventeen children. However, in an era of high infant mortality rates, several did not survive infancy. ^ James Smith Buck, Pioneer History of Milwaukee from the First American Settlement in 1833, to 1841 (Milwaukee: Milwaukee News Company, Printers, 1876), 149. ^ Morgan L. Martin, “Narrative of Morgan L. Martin,” Wisconsin Historical Society Collections 11, ed. Reuben Gold Thwaites (Madison: State Historical Society of Wisconsin, 1888), 407. ^ John Gurda, “Frontier Valentines: Living Proof That Love Can and Did Abide,” Milwaukee Journal Sentinel, February 7, 1999. ^ Patrick Jung, “The Creation of Métis Society: French-Indian Intermarriage in the Upper Great Lakes.” Voyageur 19, no. 2 (Winter-Spring 2003): 38-48. ^ Peter Leo Johnson, “Milwaukee’s First Mass,” Wisconsin Magazine of History 27, no. 1 (September 1943), 80. ^ With the influx into Wisconsin by mid-century of American migrants, the “Yankees” from the East, and of immigrants from Germany, another example of decline in status of highly assimilated and educated Métis, once “high society” in Wisconsin, was the Grignon dynasty, descendants of the state’s Métis (French and Odawa) “founding father,” Charles de Langlade, and Wisconsin’s wealthiest family. See Virginia Glenn Crane, “History and Family Values, a Good Wife’s Tale: Mary Elizabeth Meade Grignon of Kaukauna, 1837-1898,” Wisconsin Magazine of History 80, no. 3 (Spring, 1997): 179-200. ^ McBride, “Juneau, Laurent Solomon, 1793-1856,” in France and the Americas: Culture, Politics, and History, ed. Bill Marshall (Santa Barbara, CA: ABC-CLIO, 2005), 634-636. Jung, Patrick. “The Creation of Métis Society: French-Indian Intermarriage in the Upper Great Lakes.” Voyageur 19, no. 2 (Winter-Spring 2003): 38-48. Lawson, Marion. “Solomon Juneau: Milwaukee’s First Mayor.” Wisconsin Magazine of History 41, no. 2 (Winter 1957-58): 113-23. McBride, Genevieve G. “Helpmeets, Hausfraus, Hellions, and More: The Missing Majority in Milwaukee History.” In Perspectives on Milwaukee’s Past, edited by Margo Anderson and Victor L. Greene, 192-218. Urbana: University of Illinois Press, 2009. McBride, Genevieve G., ed. Women’s Wisconsin: From Native Matriarchies to the New Millennium. Madison: Wisconsin Historical Society, 2005. McBride, Genevieve G. “Juneau, Laurent Solomon, 1793-1856.” In France and the Americas: Culture, Politics, and History, edited by Bill Marshall, 634-36. Santa Barbara, CA: ABC-CLIO, 2005. Vieau, Peter J. “Narrative of Peter J. Vieau.” In Wisconsin Historical Society Collections 15, edited by Reuben Gold Thwaites, 459-66. Madison: State Historical Society of Wisconsin, 1900.